Toulouse-Lautrec was noted as a portraitist of the higher ranks of French society, to which he belonged by birth, and for his scenes of Parisian night life and its colourful characters, to which he belonged by adoption. The sitter here is Gaston Bonnefoy, who posed for the artist in 1891. Successful, independent and modern, he conforms to the idea of the boulevardier. Lautrec painted Bonnefoy and four other friends with the intention of showing these portraits at the Salon des Indépendants that year. The sitter is shown full-length in profile, dressed in a long overcoat and hat as if just returning home or on the point of going out. The horizontal position of his walking stick has been interpreted as a joke on his sexuality. Bonnefoy’s appearance contrasts with the bare, intimate setting of the artist’s studio, which is very lightly sketched in on the cardboard support. 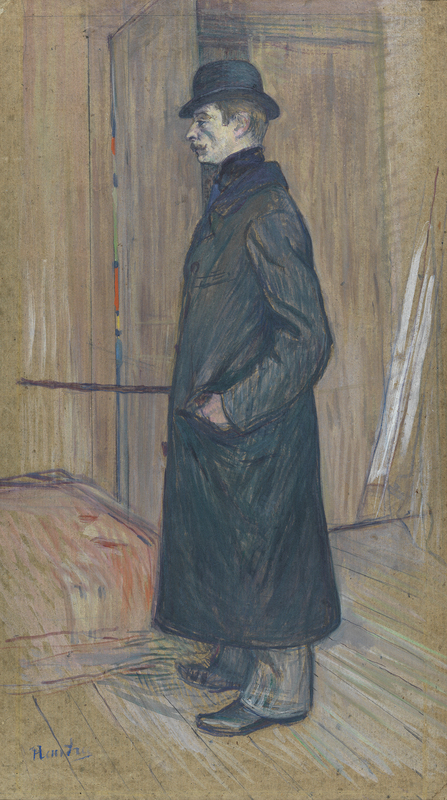 Lautrec had already executed male portraits in a similar format, possibly influenced by those by Whistler. In a letter of 1891 to his mother, Toulouse-Lautrec wrote, “I have just finished the portrait of Gaston Bonnefoy and am going to start that of Louis (Pascal). I hope they are not too unsightly.” The artist refers to the series of portraits of standing male figures which he showed at the Salon des Indépendants that March. In all of them Lautrec seeks to emphasise the verticality of the figures, which is heightened by the stark interior of his studio on the rue Coulaincourt, and presents us with a new type of portrait that reflects modern life, in the manner of Baudelaire’s writings. In this portrait of the physician Gaston Bonnefoy belonging to the Thyssen-Bornemisza collection, the figure of the painter’s friend and regular companion between 1883 and 1899 is silhouetted against a neutral, sketched background. As Richard Thomson has pointed out, Lautrec depicts him as the prototype of a the “ boulevardier masculine, prosperous, sexually independent, attuned to the modern world” dressed in outdoor clothing with a long coat, walking stick and bowler hat, as if having just returned from a visit or about to leave. Some scholars have interpreted the horizontally positioned stick as a phallic symbol, a possible allusion to his sexual promiscuity.